Join the discussion on our forums! 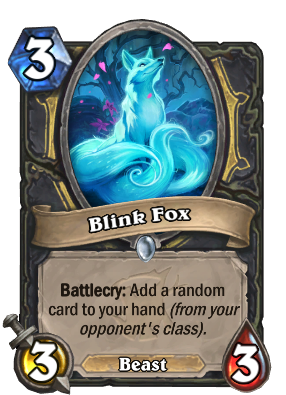 Come discuss Blink Fox over in our dedicated Blink Fox discussion topic. Great in Spectral Cutlass decks, and it has the most adorable art in Hearthstone. I'm actually considering crafting a golden pair. I love that it's a beast, stealing beast synergy hunter and druid cards will be hotness. Similar to Curious Glimmerroot. Auto include in Thief Rogue. Possible spot in a Tempo archetype. Pretty good. Who did artwork for this? It's so beautiful. this is such a beautiful looking card, it's a solid card too 3 mana 3/3 which is already a solid set of stats, with pretty much "draw a card" on it, technically it can be bad or good be imo it's good, slows fatigue but down side is random card... upside is class card.. and like 80% of class cards are good or average. FINALLY A TRUE FOX FOR ME TO PUT IN EVERY DECK I CAN. A WILD ALOLAN NINETALES APPEARED! Alolan Ninetales used Token Druid deck cards! Rogue lacked 3 drop without any requirements. SI:7 is great but without combo it couldn't be played just like that unless you really needed a body. This one... This one will serve it's purpose for sure. RnG on top of rNg. You just dont play Hearhstone. Yet another theft card for Rogues, yet another text with italized (from your opponent's class). This is absolutely Alolan Ninetales.